How do you go from $20,000 /month selling done-for-you services to $250,000 /month selling an online training program? Matt Coffman and Victor Elkins help therapists get clients online and the story of how they got there is both surprising and inspiring! Making the transition from done-for-you to online courses is one of the most rewarding and transformative things you will ever do. It unlocks limitless scale and unleashes your knowledge and expertise to the world without you being the bottleneck. And in todays customer interview, Matt Coffman explains exactly how he and his business partner Victor Elkins did it in record time. Check out the interview and let me know what you think? 1. How Matt & Victor selected therapists as their niche. 2. Why Matt strategically looks at the client’s point of view. 3. The one major problem Matt found through speaking on sales calls with his niche. 4. Matt’s findings with 1-1 services versus group coaching. 5. How Matt identified who his first hire would be for their team. 6. What Matt and Victors team looks like today. 7. Matt and Victors vision for therapy in the future. 8. Matt’s #1 piece of advice for members: Look for the one major thing you’re afraid of doing and go at it head on. Matt's transition from $20,000 /month to $400,000 /month was made possible by joining the Consulting Accelerator training program (which was previously called The Consulting Blueprint) and then later joining Uplevel Consulting. Sam Ovens:	Hey, everyone. Sam Ovens here, and today I have Matt Coffman on with us. Matt Coffman's one of my oldest customers. He's been with me almost since the beginning, and back in 2015, Matt joined an old training program I had called The Consulting Blueprint. Back then, Matt and his partner Victor, they had a business that was done-for-you digital marketing for local businesses, basically a generalist done-for-you agency that was making around 15 grand a month. He joined the Blueprint, and that helped him get some additional clients, but then in 2016, he joined, Matt and Victor joined Uplevel Consulting. 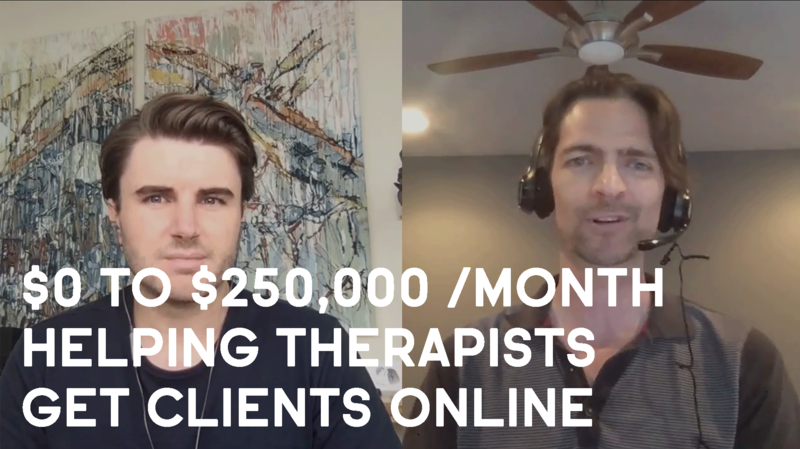 In that program, in 2016, Matt just completely changed his niche, went from done-for-you digital marketing to helping therapists get more clients online, and he switched from done-for-you to a training program. Sam Ovens:	Since then, the growth story's been awesome. Matt and Victor have grown their business to the point now where it's making $255,000 per month, and that went from zero, because, I mean, you started a brand new niche, brand new product, then, so that's zero to 250k a month in just under two years. That's a pretty awesome story. In this interview today, we're going to dig into it, see why they chose therapists, which is something I'm interested to find out, and also how they grew to the point they're at right now. Thanks for jumping on and speaking with me today. Matt Coffman:	Yeah. My pleasure. I wish Victor could be here, so he says hello, but I'll do my best to convey our story. Sam Ovens:	Cool. Let's go back to like 2000, like just before you joined Uplevel, 2016, and explain what your business was doing back then and what was going on. Matt Coffman:	Victor and I partnered up like nine years ago, and we were doing, basically we started, I was helping him with an IT client, so we had IT clients, because Victor's background was in system administration, and I was doing web development. I had interests in copywriting, and online marketing as well, and so by 2016, we'd worked with lots of clients in lots of niches in doing lots of done-for-you, so we had monthly IT clients. We had built many websites, and we had done some digital marketing, and through Consulting Blueprint, we'd actually gotten a client ... Just, it's funny to think back. I mean, just Consulting Blueprint had a 50 to 1 ROI for us because of a couple clients we got on the monthly retainer, helping them with their AdWords, helping them with websites and other stuff on the side. Matt Coffman:	Early 2016, we were doing that, and I saw the Uplevel offer, and I knew that what we were doing was way too complex to get us where we wanted to go, and so the message you presented about a more focused approach with a really predictable system for getting clients was exactly what I was looking for. Victor and I talked about it, and we had such a great ROI already at that point from Blueprint that we decided, "Let's jump into Uplevel," but I didn't realize it was about that, the program idea. At that point, I hadn't thought of that. I just figured that we'd get more clients, so that's why we joined Uplevel initially. Sam Ovens:	Got it. See, it's interesting. Just because you had a good experience the first time, you just kind of blindly trusted that the next program was going to be good too. Matt Coffman:	It was a no-brainer, when we already had seen Consulting Blueprint had paid for itself even within six months like 20 times, whatever it was, so it was like, "Okay. I mean, obviously, let's see what the next thing is." Sam Ovens:	When you joined, and then you found out it was quite a dramatic change, because I remember going through this change myself. I was selling done-for-you, and then I was helping other people do done-for-you, and that's what the Blueprint was all about, but then in Uplevel, I was like, it's actually more scalable to change to programs, but that's like a night and day difference, like what was that like going through Uplevel and kind of seeing that that was the shift you had to do, had to make? Matt Coffman:	It was interesting, because at that time, at least, Uplevel didn't say you have to do a program. It was just, everything was laid out in terms of the content, and it just starts to dawn on you as you go through it that you have these options, you can keep doing done-for-you, and you can use these methods in Uplevel, or there's another way you could start to package things as a program. That just started making so much sense as we watched Uplevel unfold, as we went through the training, and as we thought about, "Where do we have expertise, and what do we want to do?" The process of Uplevel took us to the inevitability of, "Yeah. Let's build a program off of something that we already have a lot of experience with." Sam Ovens:	Got it, and then why therapists? Because that's completely different. You were doing web development. Victor was doing systems administration, and you were doing done-for-you digital marketing, so none of those things is helping therapists, so how did that come about? Matt Coffman:	All right, so probably seven or eight years before that, I had put a Craigslist ad up for web development, and I got a bunch of clients. At that time, it was actually possible. You could just put a good ad on Craigslist, and suddenly, I had tons of clients and was making more money than I had ever made even just doing that, which I got off of a blog post I found online. One of those people who originally reached out to me was the therapist. He thought that he'd been hacked. He thought his website had been hacked, and really it was just the auto-registrations on WordPress for his users. It was just random bots, but he was going through some stuff in his life, and so he put one and one together thinking they were connected, when they were totally separate. When I was looking at that issue and could tell him, "Hey, you haven't been hacked," I also noticed, "Honestly, is this working for you, this website? I mean ... " Matt Coffman:	Because part of the issue when you're a web developer is, you build a website, but then the purpose of the website is to build a business, not to just have a happy website out on the web somewhere. [inaudible 00:06:05] there were just a lot of mistakes. It wasn't mobile responsive. The content wasn't that good. The design wasn't that good, etc., etc. He trusted me after I helped him resolve the issue of feeling like he'd been hacked by what he thought had been going on, and so I basically worked with him, built out his website so it was much better, designed it more for conversion, talked him through, "What are your clients like? What do they want? We need to communicate to them," that process. Matt Coffman:	Then it worked really well, so his practice just took off, so he referred me to a friend. I did the same process with her, she referred me like five friends, so all of a sudden, I'd worked with like half the therapists in Nashville, and this was over the course of several years of just kind of working with one, and then they refer me, and they refer me. Matt Coffman:	Around the time of Uplevel, I went to a dinner party, and it was one of these therapists, the first person he had referred me to, and I looked around the room, there were probably 25 people there, and I'd worked with half of the people there, and they were ... All the therapists in the room, I'd done their websites, or I'd helped them with AdWords or, consulted on some tech stuff. One way or another, I'd helped all of the therapists in that room, and everyone else was like their spouses and friends. We were going through Uplevel, and so I'm already thinking, "Where do we have expertise?" That party just, everything clicked, and I was like, "Oh, of course." Matt Coffman:	I had a lot of doubts, initially, and we went through that quite a lot of, "Is this a viable niche," and, "Oh, my gosh, we chose the wrong niche." All that stuff, but that party and seeing all those people, I would keep going back to that when the doubts would come, and here we are. Sam Ovens:	Got it. Matt Coffman:	Yeah. Yeah. Sam Ovens:	You just looked at every done-for-you client you had and looked for a pattern, and a trend, and you saw pretty much all of them were therapists. I remember Andrew Argue did the same thing. He looked at his, and pretty much all of them were accountants, all people related to accounting, all people he met through accounting, and so then that was obvious for him, too. Matt Coffman:	Yeah, and with Victor, as well, he looked around, and we decided we would try two things simultaneously and see which one took off, and then put everything in that one. He actually tried HVAC and plumbing contractors initially, as well. Our biggest Consulting Blueprint success story was a plumbing company, plumbing, HVAC. We started two funnels simultaneously, intending to, whichever one took off, we'd go with that one, and the therapists just took off. When we took the funnel live, it was so crazy. I was at Victor's house. We took the funnel live, "Okay, great. What's going to happen? Who knows," for the therapists. Then I get in my car, I start driving back to my place, and within 10 minutes, we had our first SS for 30 minutes from them, so I turned right back around and went to Victor's house and did the first SS within 30 minutes of taking, or maybe like within an hour of taking the funnel live. That was such a sign of, like, "Whoa, okay. This could work." Sam Ovens:	Got it. For people listening, it doesn't always happen like that, so if you- Matt Coffman:	Totally. Sam Ovens:	If you don't get a strategy session happening within 30 minutes of putting your funnel live, don't get disheartened, because- Matt Coffman:	Totally, and it didn't work that way for Victor's. The HVAC, when we tried that, it was much harder to get the messaging. It was much harder to get in front of them. There's a much different process in the market. It was just a good fit of, I just knew them so well, and so even my first attempt at the ad, plus sort of therapists need the help. They're on Facebook. There were a lot of different reasons that worked, but it was just, it was such a sign like, "Okay, this could be something," but- Sam Ovens:	This- Matt Coffman:	... definitely [inaudible 00:09:30]. Sam Ovens:	... is interesting, because it's hard to believe that this therapist thing just happened like that because one person found you on Craigslist, and then it spread like that. Do you have any affinity to therapists, or are you interested in it or passionate about it, excluding that incident that happened on Craigslist? Matt Coffman:	Yeah, so going back further, definitely. I've been in therapy. I've benefited from it. I come from a background where my dad was an alcoholic, and there was a lot of challenge in my house. As soon as I got ... I grew up in Nashville and went to California for college, just got as far away as possible from all of that stuff that had been going on, and then basically embarked on a quest of trying to figure out, why was I so depressed, how do I deal with what was going on. I finally had space to do it, and being in college really brought up a lot of stuff. Matt Coffman:	I'm on my own. I knew that I didn't want to replicate those patterns, and so, yeah, I definitely sought out therapy myself, and over the years, subsequently, so through college and then in my early 20s, benefited a ton from different phases with different therapists. I believe in it. I think it's a really powerful option for people when they really want to work through stuff that is pretty hard to work through. I've seen the benefit in my life. I've seen the benefit in other people's lives. My wife and I did premarital counseling before we got married, definitely, to get our communication better and benefited from that, so I've had a lot of experiences of therapy being good. Matt Coffman:	I think I just, I could have been a therapist. I have a pretty similar, I'm more of an introvert. I'm more ... I'm definitely interested in ideas, and communication, and just a lot of similar, similarities between me and the people I'm working with inside our program. Sam Ovens:	That makes more sense. Matt Coffman:	Yeah. Sam Ovens:	Yeah, other than just the fluke of through the Craigslist there, but it's funny how it happens. Right? Because somehow, just your style of writing, and everything, probably, you put it up on Craigslist and the first one who bites, it's because they must have resonated with the way you spoke, and then you had a good relationship with him, and then clicked, so then he spread you to other people, and so it's ... A lot of it stems from the fact that you're genuinely interested in it and genuinely believe in what they're selling, too. Matt Coffman:	Totally, yeah. I mean, we had other clients. We had title companies, and insurance companies, and lawyers, and all these other kinds of companies, but it didn't become the kind of thing where I'm hanging out. That guy is a friend of mine now, that very first therapist I worked with. I actually, we hang out. I meet up with his family. We'll have dinner, whatever, and we like each other. It's like, it's a friendship. That, it makes sense. It makes sense based on my background and, of course, now, watching what we've done in our program, it's like, yeah, there is a connection. It isn't random. Matt Coffman:	At the time, on the Craigslist ad, I didn't put two and two together, and even at the time, until I was at that dinner party, while working through Uplevel, I didn't even notice, for years before, all these therapists. It hadn't even occurred to me until that moment, and Uplevel's training, and seeing what we ... I'm thinking, "Okay, how do we put something together? How do we offer something scalable and valuable?" Then, "Oh, okay, it all makes sense now," where I didn't see it up until that point at all. Sam Ovens:	Yeah, and this is what gives someone an edge. Like if a normal internet marketer comes and starts offering like funnels and Facebook Ads for therapists, they just pick therapists, because they think it's a hot niche, or because you're doing good in it, but it goes like ... You've been in therapy for a lot of your life, and then you're thoroughly interested in it. You probably read books about it. You're friends with these people. You believe in it. That gives you a massive edge over most other people, and that's why it's so important. Sam Ovens:	For people listening, that's why you have to believe in what your clients are selling. What niche you get into, you've got to believe in it. You don't want to just be selling it and just think like, you don't believe in it, and you don't think that the people on the other end are going to understand it or buy it. You need to be able to get into their shoes and their perspective, and you are able to do that because you were on the other side of it, and you were seeking different therapists, you knew the buying cycle and the buying process. You knew everything in there. Matt Coffman:	Yeah, and I saw, because of my experience, also, working as a web developer, digital marketer, I saw how bad their ... Just, if you leave them to their own devices, it was clear they just, it's all about them. It's very, very boring. Basically, they're coming from an insecurity that they need to prove to everyone that they have licensing and education. As a client, and this is something that goes back to people, "Well, you're not a therapist, so how can you help therapists?" Well, it's like, I'm the client. My job is to be the client. Seeing what they're putting out there as the client to help them communicate with the client. Right? Matt Coffman:	That's the big mistake most therapists make. I think it's the big mistake most people starting businesses make, is not thinking from the client's point of view, and so that's been really ... I think every time someone comes at me and asks like, "Hey, well, how can you help therapists if you're not a therapist? You haven't grown your own practice." It's like, "Well, right, I'm the client." I represent the world of the client, and I actually am a client. That's not an artificial formation. It's been pretty instrumental in being able to help them, is being able to take that position genuinely. Sam Ovens:	Yeah. I guess with me, too, like the ... I got good at making courses and selling them by being one hell of a buyer. You know what I mean? Like- Matt Coffman:	Yeah. Sam Ovens:	... being one hell of a student, one hell of a purchaser of trainings, and learning, and that's how you get ... That's often how you get good at something, is by doing the opposite of it, so if you want to get good at selling, you've got to understand buying. You want to get good at anything, you've got to understand both perspectives of it. Matt Coffman:	Totally. Sam Ovens:	You chose therapists, and with this funnel you had set up, at that point that you had the first strategy session, did you have the program built? Matt Coffman:	No, and the program changed so radically from what I imagined it would be as we got going, so no, the program wasn't built. I had an outline of what I thought would be good to cover, which probably half of that did actually get built into the program, but half of it was totally not what they needed. As I went and was talking to them, the strategy sessions were amazing, just from market research. I think I actually sold the second person I spoke to. It took him ... It was a long sales process, and it took probably 10 days, but he did buy, so I did get some success out of the gate, but [inaudible 00:16:05] program [inaudible 00:16:08] the beginning of the program for maybe a week after he joined. I raced and created the first week, and after that, I was laying the track down right in front of the forward-most student, as I was continuing to run the funnel, do SSs, and sell people in. Sam Ovens:	Got it. What did you find was their problem? After doing the strategy sessions and things, and understanding the market, what was the one common issue that kind of ran, that was a thread that ran through the whole industry? Matt Coffman:	Basically, so they have a ton of education, and they've spent a ton of money on their education, ton of time, and they didn't get any business education whatsoever, and so they just were suddenly dropped into ... If you want to have a private practice, the options aren't very good, so okay, just take a ton of insurances, and that's not a very fun lifestyle for them, as I came to discover, as I was talking to them, that they hate dealing with multiple insurance companies, and whether they're going to even be paid in the length of time it takes, and the reimbursement rates, and all that stuff. Just fundamentally, they just didn't know what to do, and so all their ideas were very old-school, like pass out business cards and brochures, which is not reliable, not predictable, not scalable, and not even effective. Matt Coffman:	They basically just had all this education about their expertise and zero about how to grow their practice, and that there was an obvious, "Okay, let me be the bridge from your expertise to a full practice, and we'll just figure out what it takes," but I'd already run this system with some of the other therapists. I knew you needed a strong message. You needed lead gen. You needed, the way that you need to market a therapy practice is so connected to what therapy is, and so you can't just do anything. You have to think about ... This is, it's sort of like ... It's a very intimate service. People have a lot of shame around it. It's very intense. When someone's looking for a therapist, they're in a very vulnerable place, and most therapists completely didn't rise to that challenge. Matt Coffman:	Instead, it was like, their headline would be, "Welcome." "Welcome" is classic. It's not, "Here's what I offer, and here's how I can help you." It's just, "Welcome. Welcome to my site. It's very scary to look for a therapist. You're probably very afraid right now." It's just, the opposite of what I needed to hear when I was looking for a therapist, and so that was the big distortion, was they had no ... They had all this training on one thing, none on the other, had no idea how to communicate, even though they're psychologists, they're trained in thinking, and feelings, and the mind. It just didn't translate into business technology, marketing. That was the ... It was just very obvious. They needed a way to grow a practice. Sam Ovens:	Got it. It's funny, because there's the whole public opinion about therapists, you even see it on TV shows, and movies, and stuff, if someone, or like in your own ... When I recommend it to other people I know, it's like, "Oh, you should see a therapist about that," and the almost instant response back is, "But then that would mean I'm crazy." Matt Coffman:	Totally. Yeah. Sam Ovens:	That's so funny that that is actually what most people believe, but it's like, it makes no sense, you know what I mean? Matt Coffman:	Totally. Yeah, I mean, and some of that's just societal, our developmental level as a culture, and our ability to recognize interiors, and feelings, and things like that, some of that is just large-scale distortions that, it's unfortunate, but it's something that, if I'm a therapist, I am dealing with. Then the question is, are you going to deal with it ham-handedly, skillfully, consciously, or just totally bypass it, but one way or another, it's out there, and most therapists aren't doing their industry favors with the way they present their work. It's just very boring at best. Matt Coffman:	Yeah, it's become quite an interesting journey to get to know more, and more, and more, and more therapists all over the country, and just see, and believe even more in what they offer, and so it's become much more of a mission every year that we've been doing this, just seeing ... There's so many cool things going in the world of therapy, and different modalities, and different evidence-based processes, and all these different things that are happening, and nobody knows about them. Which is really unfortunate, because there's a lot of people who are very unhappy. Suicide, depression, and there's so many good tools that people don't even realize. That's been really fun, to believe more while working with these therapists, rather than be like, "Oh, it's true. Actually, it is a big waste of time and money." That hasn't been my experience at all. Sam Ovens:	Yeah. Yeah, I think the hard part about therapy is that, by going to one, you have to admit to yourself that you actually have a problem. Matt Coffman:	Yeah. Totally. Sam Ovens:	I understand that these people were, they're very good at talking to people on across the, on the other chair, opposite them, right, when they're face to face. Matt Coffman:	Yeah. Sam Ovens:	But the moment they have to think about how to have that same conversation over the internet to someone whose facial expressions they can't read, and they're doing it to lots of people all at the same time, they can't really conceptualize that, understand that, and get that happening, but you can really show them how to make that, how to get that same connection that they have in the room with people on the internet via their computer. Matt Coffman:	Exactly. Sam Ovens:	Got it. You sold your first client. You said it was starting in ... Which happened from your second strategy session, you said the program was starting in seven days. In those seven days, you built week one, and then as he tracked through, you just stayed, just in time, one week ahead. How did the first version of that program go? How many people did you put through it, and what were the results like that they got? Matt Coffman:	I ran that first version for about a year and a few months before I finally got the second version out. We probably put through over 100. I'm not sure ... I sold five the first month. Then I went into a big slump the second month, sold one. Then after that, we've always sold more than 10 every month, and increasing, 10, 12, 13, 14, 15. It's kept increasing. The first version was great and very successful. I mean, I just, I actually had been working with therapists for years, and so I really was just systematizing what I was already doing with people one-on-one. It was a very straightforward ... Obviously, the first time you do that, is it going to work or not, so I supplemented with one-on-one time in the beginning, but now we use the group call model. Matt Coffman:	I actually found the one-on-ones counterproductive, and now that we've not been using the one-on-ones, people get way better results. That's been really fun to see, and it's great, because these therapists really want one-on-one. They think in one-on-one terms, and, at least for their business, it's not what they need, because it lets them sort of hide and whatever. We've slowly rolled out the whole system. We transitioned off the one-on-ones, and the first version of the program lasted probably 14 or 15 months before I ... I was making tweaks along the way, but then I just did an entire new version last year, last summer or so. Sam Ovens:	It's funny, that one-on-one thing. You swear it's what people need to get results. You swear it's the only reason why they're buying. You swear it's the only thing that they value in the program, but yet it actually hurts them. Matt Coffman:	Yeah. I wouldn't have believed you unless I'd actually experienced it, and actually seeing the results before and after, but it's true. Sam Ovens:	It's like in sports teams and stuff, the coaches never actually motivate, and follow up, and check in on the players. They just raise the standards and expect everyone to be there, and that's kind of what happens when a coach, or a program, or a consultant reaches that level of maturity. They're like, "I'm not going to chase you. I'm not going to check in. This is your responsibility." Matt Coffman:	Totally. Sam Ovens:	Makes a huge difference. Matt Coffman:	Yeah. Sam Ovens:	Then tell me why you built a new version. Because I know in the online course space, most people don't build multiple versions of it. They just go and build another program in a different thing. Another program, another program. Building a new version isn't even something that people do, so why did you decide to do a new one? Matt Coffman:	A program is basically a machine. It's a system, and you're putting someone in the beginning, and you're trying to get them to get the best result possible as consistently as possible. I had that understanding from just building it the first time and watching all the questions come in, because when you're running a program and you're ... I was working so close with these people. When I was doing the one-on-ones, it may not have been as effective for them, but it definitely gave me an immense ... I mean, it took my level of understanding of their issues and challenges, and where they get stuck, up. That was how I was able to create a better version, was being in so much contact in the group calls, in our Facebook group, in the one-on-one calls that we did do. Matt Coffman:	I just had a laundry list of, "Okay, that's constantly coming up. I need to fix that. That's constantly coming up. I need to fix that," and I would plug holes, but eventually my understanding of how to do this became so much better, even because I'm always trying to take in ... I want to get this to be the easiest, most straightforward, "If you actually follow this map, you will get the result." There were a lot of improvements to make, and finally, it was like, "Okay, we have something here. What happens if I just give everything to make this as good as I can possibly make it from everything I've learned since we started?" It's been massively worth it. Yeah, I would ... I can't wait to do again, honestly. It seems like a neverending process. It could be. Sam Ovens:	Yeah, so this is good, because a lot of people believe that if they want to make something better, they have to add to it, like add another program, or add more stuff, or add more tactics around anything. But even if you look at like the evolution of species and things, it's not the addition of things. It's the removal of errors that actually makes something stronger. It's actually, removing an error is more powerful, or removing a negative is more powerful than adding a positive. That's what you did. You said you plugged holes in it. You found every little place that anyone could get confused, which showed up to you through the one-on-ones, and the group calls, and the Facebook group, and then in the next version, you eliminated the root cause of those, so the system gets more efficient. Matt Coffman:	Yeah, and it's ongoing. I just did another ... I called it like the 2.5 update. I just streamlined some things, fixed some things, added a video here that replaced a video there, and I'm about, this month, one of my big projects is to redo all of two weeks of the program, because technology's improved, some of the stuff that we teach, I want to evolve it a little bit. It's an ongoing process, and I'm 100% clear. It's absolutely the most valuable thing I can be doing. Yeah. Sam Ovens:	Cool. Now, let's talk about the results. As people have gone through, like the therapists, what has their interaction been like? What have been some of the challenges for them, and what sort of results have they got from the program? Matt Coffman:	That first guy who bought, I stay in touch with him, and just a couple of months ago, he had told me he was making maybe 7,500 a month at that time, which is pretty good. He's a good therapist, charges a decent rate, all that stuff, but he was already, by like the 20th of the month, he was at over 25,000, so he's, I don't know, quadrupled, or he's quadrupled in two years. For a therapist, that's pretty insane. That's pretty amazing. They're working one-on-one with people, so they don't have the scaling in the same way that someone who's selling a program does, but their work is important, and he's doing it with more people, and he's raised his rates a few times, so that's one ... Matt Coffman:	We had a guy who, very soon, like in that first cohort of people, once we got everything set for him and live, he went from like five to 25 clients in five weeks, or something. That was our first big just rocket. Just, he took off like a rocket. From there, he was our biggest, singing our praises, and people coming in, just because they heard his story and couldn't believe it. We've had a lot of stories like that. We've just got so many, so many, so many results for people at this point. Matt Coffman:	As far as the challenges, I mean, I would say one of the biggest challenges for therapists is, they have, I don't know what's the deal, where it's coming from, but this, they have a lot of perfectionism. I think it's coming from maybe their education or something. They have a really hard time allowing a message to go out there that you don't know if it's perfect or not, seeing what happens, adjusting it, taking the feedback, and doing that feedback process. For example, if my first version of the program, maybe they wouldn't ever have even put it out because they didn't think it was good enough and it needed to be perfect, and they would work on it for years and years and years as opposed to just go, go, go, go, go and then take the feedback and make it better. Matt Coffman:	I think I see that a ton. Just whatever we're working on, they think, "Oh, this message isn't perfect," and it's like, you can't be. You have to take it to the market, see how the people react, talk to people on the phone, get feedback, improve it. It's going to continually improve. If you get better, it will get better. That's one of the big ones. I mean, just, it's mostly internal stuff. It's mostly mindset stuff. Resistance to technology. They just assume they don't know how to deal with anything, and so if I'm teaching them how to run something online just totally freaks them out, some of that technological training, so I would just say a lot of it's mindset, whether we're talking about perfectionism, anxiety, like financial stuff. Matt Coffman:	"Business" is not a nice word in the therapy world, typically. You don't want to be unethical, so you're more worried about being unethical than you are about making an impact as fast as possible with as many people as possible, so a lot of that inner stuff, I think, is the big challenge that they deal with. Sam Ovens:	It doesn't sound to me like this is an issue just with therapists. Matt Coffman:	[crosstalk 00:30:11]. Sam Ovens:	It sounds like this is an issue with the human race. Matt Coffman:	Yes. Sam Ovens:	Stubbornness to change and forgetting how evolution actually works, that it takes trial and error, practice time. You start off at anything bad, like riding a bike, and then you learn, but we seem to forget that all the time, even me. It's a flaw. The results they got were good. Now, let's talk about how you were actually able to take this thing to 255 grand a month. What did it really take to get to that level? Matt Coffman:	Yeah, so in the beginning, it was Victor and I. He did all the sales, and he started running the ... The very beginning, I was doing everything for the first three months or so. Then Victor started doing the sales, and then he took over the Facebook Ads, and so I was running the program, working with the people, doing the calls, doing the one-on-ones, building the program, iterating the program, handling our finances and stuff like that, and then Victor was doing all the sales calls and running the funnel. We did that for a year, and I don't think in my mind I was trying to build a big, strong business. Matt Coffman:	I think I came more thinking like, "Hey, if we can have a good lifestyle, if we can make 10k a month each, that would be great," and then it started growing and growing. The evolutionary process took hold. Right? Like we're growing, we're starting to get a taste for how fun it is to make an impact on so many people, and so we started growing our team. It was how we, we were doing probably, I don't exactly remember, but we brought a teammate on a year ago, like our first teammate, probably like 13, 14 months ago, and that freed me up to make the second version of the program. Then we kept, we added another person at the beginning of the year. Matt Coffman:	Then we built out a sales team, because we just, we knew at that point like, "Our results are out of control good. People love the program. Let's see, we want to grow," but we also, I think my mindset challenges have been around that, around being comfortable growing and having a bigger impact, but there's been some inner stuff I've been working at at least ... I don't want to speak for Victor and his challenge, but that was for me the big barrier. Once we had a known good solution, we proved that bringing teammates on actually helped us. It really helped spread the workload, and so we can maintain quality while increasing number of people sold in. Matt Coffman:	Then it's like, "Okay. Let's just, let's keep going," and so that's, and so it was by just getting better at everything. Getting the program better, getting our team strong, getting our funnel better, our ads better, our message better, our sales better. Everything, we just kept improving, improving, improving it, so we were naturally growing, but really installing the sales team in this year has been the big boost that took us up from where we were at, like 125, to 250. Sam Ovens:	Got it. Who was your first hire 14 months ago? Matt Coffman:	It was an operations person. She took over a lot of the customer support and just some of the specific tasks that we do inside the program so that I could then not have to work other than on the group calls and go and really focus on redoing the entire thing from top to bottom. That was the reason we hired her, and she's been fantastic, and so now we have several ops people, several salespeople. Yeah. Sam Ovens:	What was the pain that was popping up for you, or the repetitive tasks that were popping up for you that made you think, "The first person I need to hire is an operations person"? Matt Coffman:	I mean, it was, I didn't have enough time to build the program and run the program simultaneously, so to redo everything from top to bottom the way I knew it would require, there was no way I was going to be able to do that with the workload that I had, just helping everyone. Just being available in the ways that we are in the program for the things that we do. Yeah, we definitely have a more hands-on approach, I think, than some people with a program, like we'll edit people's web copy. We'll do things like that, really, [inaudible 00:34:25] at the same time, our results are like, there are other people who work with therapists, but, I mean, our results are so, you can't ... Matt Coffman:	I mean, our results are ridiculous. Look, when you actually, when people hear our results of our students, they just can't even believe it, and I've listened to the market and what they tell me about their experiences and these other programs, because we'll get them on the SSs. I've been really, that customer session has been a part of us since the beginning, and that's why I brought her on. I didn't want to take any, I don't want to take the eye off of making sure everyone was doing as well as they could, but I knew I needed a big bandwidth opening to be able to redo the program. Sam Ovens:	That's a good kind of thing to spot when you know you need to hire someone, when you know you need to do something crucially important, like rebuilding the program, but you can't, because all of your time is busy doing this thing, which isn't as important as doing the program, but it's still something that you have to do, so like that you're snookered. Whenever you're- Matt Coffman:	[inaudible 00:35:27]. Sam Ovens:	... in a position like that, you got to hire, because otherwise, why would you keep doing something that isn't as important as doing something else? Matt Coffman:	Totally. Sam Ovens:	That makes sense, and then you got that covered. This is a good lesson for a lot of people who have programs or any type of business, really. A lot of people, they think, "Bring on marketing muscle. Bring on sales muscles and just scale the thing," but what I think's more important is the customer experience, and you want that to never, ever, ever drop. You almost want to cover that thing first before you start throwing more scale on, and that sounds like what you did before you wanted ... Before you started cranking it up, you made sure you had an operations person there. You made sure you built the new version of the program that had the holes plugged in it. Then you cranked it up. What was the max you got to with just one sales rep, which was Victor? Matt Coffman:	We probably did 20 to 25 a month with just him. Sam Ovens:	Is that thousand? Matt Coffman:	Sorry, sales, so like 120, 120,000 a month. Sam Ovens:	So you go up to 120k a month with one person, and then that's when one person maxed out. Matt Coffman:	Yeah. Sam Ovens:	At that point, Victor was just jammed, and now he can't do anything else. Matt Coffman:	Yeah, and we had so much more capacity in the funnel. We could tell that, I mean, we couldn't run ads 24/7 because we were just, there were no spots, because there was just one calendar. It was obvious there. It was like, "We obviously need to get another calendar in here, so we need to hire a salesperson." I mean, it was, we knew everything else was ready for it, and so yeah, it was just, then it was like, "Okay, how do you find a salesperson?" We navigated that, got someone, and she's been amazing, so yeah. Sam Ovens:	How many salespeople do you have now? Matt Coffman:	We have two right now. Sam Ovens:	That makes sense, so they're doing like 125 each. Matt Coffman:	Yeah. Sam Ovens:	Cool. Then Victor's still doing the ads? Matt Coffman:	Victor's still doing the ads. I mean, those are pretty dialed in at the moment, and so we're ... Like I would say our next addition would be someone to help us there, someone to run the funnel, yeah. Sam Ovens:	Right now, you got Victor doing the ads, you got two people doing the sales calls, and you're running Facebook Ads to the funnel, the VSL funnel, which is going to a calendar, and a survey, two reps doing those. You're selling them into your program, and you're making the program better, like constantly, your operations person is making sure customer support and all the internal mechanisms of the program are all working well. Is that pretty much the business? Where else have you got people right now? Matt Coffman:	We added another operations person at the beginning of the year in preparation for the salespeople, so since, we knew it was going to be double. Our aim was doubling everything, so we wanted to double the operations before it came on full on, once the salespeople got up and running, so we doubled operations. We have two operations people. We have the two salespeople. Victor's running the ads. I'm focused on the program and improving that and just general business direction and a lot of different tasks, as you know. When you run a business, there's a lot to do, but that's our business in a nutshell. Then we have a VA behind the scenes who just helps us with a ton of stuff, so we have ... He's been with us, actually, he was the first hire, actually. I brought on, that was over a year and a half ago. We brought on a VA just to help us with all kinds of little stuff. Yeah. Sam Ovens:	Got it. What's most of your time spent doing right now? Matt Coffman:	I've got two group calls per week. I definitely am active in the support, in the Facebook group specifically. R&D, trying to just make sure that I'm pushing the envelope on our methods, and creating new content, creating new, like redoing parts of the program. That's the majority of my time right now, and then I'm also still getting used to having the luxury of all of this time and spaciousness with the team, like getting, having a team is a totally different experience from where we started for years and definitely with the program, where we were just ourselves entirely lifting the whole thing on our own shoulders, and so I'm still figuring that out. Every day it's a new journey of like, "Okay. What's the best use of my time? How do I take advantage of the team, and where is my time best spent?" Matt Coffman:	I know the program and improving that is pretty much the answer's always yes to that, so that's where I tend to go, but there's a lot of ... I'm sure there's a lot more things I want to keep doing, I want to keep learning how to be, how to run this thing the best way possible, so yeah. I still have a lot to learn. Sam Ovens:	Got it. What do you, what's the plan for the future for your business? Where do you want to take it one year from now, five years, 10 years? Matt Coffman:	Yeah, that's a good question. I mean, a year from now, we definitely want to keep growing it. We know there's a lot more opportunity here, and we know we can help more people. If we're talking about a big mission, the big mission would be to really change the conversation around therapy and help people have a really good experience working with great therapists and able to find the therapists for them, because it's such an individual connection with this person, the relationship is such an important part of it. Right? That ... Just continuing to help more people find great therapists and help more great therapists find good people, that mission is really our focus moving forward. In a year from now, we'd like to at least double, and we'll see what we can do. I have an appreciation for how much work all this is, and so it's like we'll do our best and work as hard as we can, and at the same time, there's just always something's changing, we need to learn, and so it's a journey trying to figure that out. Matt Coffman:	As far as five to 10 years, I mean, I didn't think any of this was possible, and so I'm continuing to try to expand what I think is possible. That's what, I love being in connection with you and being in a mastermind with you, just because it's always about raising the standard and seeing what's possible, so that's what we're doing right now. We're really trying to say, "Okay, so we didn't expect to do three million a year. Now, we are. Can we do six? What about 12? What about 100? What happens? How do you get ... " Just taking on those experiments of like what would happen if we were able to help more people. What would that look like? We're really exploring that. I don't know what it's going to look like five or 10 years from now, but that's our intention, is to keep finding new ways to help people. Honestly, we love what we do. It's very, very rewarding, so continuing to do it is definitely what we want to do. It's just a question of how to keep growing. Sam Ovens:	Make therapy mainstream or make therapy fashionable. Matt Coffman:	Yeah. Sam Ovens:	Like to the point where it's not like, "Oh, it's just for crazy people." It's like everyone uses it. Matt Coffman:	Yeah. Sam Ovens:	Because really, everyone should have a therapist, or like maybe not all the time, but at least everyone should have an interaction with a therapist pretty much at least like once a year. You know what I mean? Matt Coffman:	Totally. I mean, the world is becoming more complex. There's so much going on. It's like having a coach. I mean, therapists can, there's a lot of coaches going on, but a therapist does, it's sort of, there's a lot more training involved to be a therapist. There's a lot of licensing and hoops to go through, and a lot of that is actually really valuable, how to deal with people who are going through intense, intense, intense stuff, whether we're talking about addiction, we're talking about abuse. Matt Coffman:	It's to be able to go down into that stuff, it's the mental internal equivalent of a brain surgeon, or a cardiac surgeon, or something. It's very strong, and so for people to know these resources are out there, obviously I would love to see a world where people don't resort to just mass shootings because they're depressed and angry, and they have a way to work with what they're feeling and actually do something constructive. Whatever we can do to contribute to that, for sure, but I mean, our vision is growing all the time, too. That's what- Sam Ovens:	That's saying- Matt Coffman:	Yeah. Sam Ovens:	... that therapy's not just for people who are depressed. It's also for people who are really happy, but they want to perform better. Matt Coffman:	Totally. Sam Ovens:	You know what- Matt Coffman:	Yeah- Sam Ovens:	... I mean? Matt Coffman:	... absolutely. Yeah. Sam Ovens:	[inaudible 00:43:39]. Matt Coffman:	Any tangled energy anywhere, therapy can help you get in there and figure out what's going on, even if you're operating as what you feel like is, you never imagined you'd be able to do this much. It's still always more that's possible, for sure. Yeah. Sam Ovens:	Yeah, because right now, I'm working with a forensic psychiatrist, and like, because I don't know what I don't know about me, so he catches errors in me that I didn't even know were there, which is what I like, because I don't have to wait for the problem to show itself and see the mess I make to then go and deal with it. You know what I mean? It's like- Matt Coffman:	Yeah. Sam Ovens:	... and start spotting the things before they happen, and so it's like kind of like preventative therapy, which I think works better. That's why I think everyone has blind spots like that. You know what I mean? Matt Coffman:	Totally. Sam Ovens:	In doing, in going through this whole journey and everything from the beginning when you were doing done-for-you to now, what would you say has been the most transformative part of the whole training you've done with me? Matt Coffman:	Oh, man, that's very tough to say. I mean, honestly, it all works together. It's, talk about a well-oiled machine that's purposely built with every piece where it belongs. That's how I'd relate to your training. I really do, like it really helped us from top to bottom. Is the mindset more important than the sales script, or is that more important than the way to run a program versus the way to deliver the service, versus how to think about scale, versus the Facebook Ads? It's like it all is important. Every single piece, so I don't think I would isolate anything. Matt Coffman:	I know that this wouldn't work without the sales script, but the sales script wouldn't work without the mindset, and none of those things would work without the funnel, and so we really relate to the whole thing as like it all helped us. I mean, we really, when we went into Uplevel, we just every single thing we did from the beginning to the end, and we got the result, so that's a testament to the way that it was built, and so I would say- Sam Ovens:	That's probably- Matt Coffman:	... all of it. Sam Ovens:	... the best answer anyone's given me to that question so far. I've been waiting for someone not to choose one piece, because it doesn't work on its own. Like you could be great at mindset, but what are you selling and to who? What does it do? Then you can be great at ads, but then you need to know conversion rates and funnels, and then you can be good at that, but you need to know how to sell, and then you can be good at all of that stuff, but if you don't know how to create a good product, if you don't understand product development, product design, and that stuff, then, so all of it, you got to actually be good, like multi-talented at all of those different things. Matt Coffman:	Yeah. No, I ... Obviously, each piece is required, that it's not arbitrary how you put it together. When we went through Uplevel, put it together, boom, we come out the other side, and yeah, we worked really hard, and we went through trial and error, but basically, we followed Uplevel, and here we are, 250,000 a month with just an awesome business and tons of happy customers and lots more that we're going to be able to do, and yeah, I would ... The whole thing. That's my answer, for sure. Sam Ovens:	You guys have done exactly what I recommend, which is pick one niche that you're interested in, stick to it, become the best in it. Just have one simple funnel. Just use one traffic source, like Facebook Ads, one funnel. Then have one method of selling it, like one program, and then just keep making new versions of all of these things to make them better, better, better, better, better, better, better. That's actually how you grow. Instead of trying to build different products, different niches, different programs, different sales mechanisms, like you did ... That's what I teach, but it's rare for people to actually follow it exactly, and you guys did that, and so that's why I reckon you guys have been so successful with it. Now, you're just pushing the limits of every one of those pieces further. Matt Coffman:	Yeah, and every time I think we've hit the limit, we haven't hit the limit, and there's more where that came from. That's been, that's the part that is really exciting now, is just what's possible. Not in an overwhelming way, but just in a, "Oh, so basically, do we add a third salesperson?" I mean, why not? Right? Like how do we ... I'm constantly like the customer focus. How do we maintain or make things even better with more people going in? How do we take our current results and make them look like just the beginning and get even better results? That neverending improvement process that it's super exciting, and that's, yeah, I mean, just with this one thing, with this one funnel, with this one way of selling it, we have not even remotely tapped what's possible. Sam Ovens:	What's a problem that you're facing right now? Because things are going good, but there's always something. Matt Coffman:	I mean, honestly, like where we're at right now, we just, we know exactly what we need to do, like we don't really have a problem right now. It's just, what do we want, and are we willing to pay the price? It's really simple, like everything's working ... Like yeah, I mean, it's every day there's certain, sometimes there's a customer who's annoying or, whatever, something happens, but as far as actual problems where we're just like, "There's a problem," it's just continuing to hone our systems. In like bottlenecks, we have maybe a couple little bottlenecks, but it's not a big deal. We can handle what we're doing right now, and it's a fine-oiled machine. We can just keep going, we can keep going, so any problems are like, we invite them because we want to grow more. That's how it feels right now. Sam Ovens:	So you know what you need to do, that's a good position, but you still need to do it, so kind of the thing that's stopping you is ... Well, not stopping you, but slowing you, is time. Matt Coffman:	Yeah. Sam Ovens:	Yeah. Matt Coffman:	Totally. Sam Ovens:	That's who I feel is my greatest enemy right now is just, "I know exactly what to do, but man, it's going to take a lot of work, a lot of time, a lot of humans." That's the thing that is the obstacle. Matt Coffman:	Yeah. We had the mastermind just this past weekend, and leading into it, and we just had no questions. We just know exactly, like we know what we need to do, and we know if we want to keep going in the direction we want to go to. We know what we need to do for that. We know what's important to keep our focus on, our customer experience, the quality of our program, the results that we're giving, so we don't have any confusion about that at this point, and so it's the luxury of thinking, "Okay, what's next," in a fun way. Like how, can we put on some new fuel into the engine in some way, like a third salesperson? Is that what we want to do? Do we wait here for a second and just improve the program a little bit more? But these aren't problems. These are fun things to think about. Yeah. Sam Ovens:	It's going to be innovation on the customer's behalf, so instead of starting to think of new, radical things they could do, instead of just doing everything better, you know what I mean, like a big jump in everything, that's what I would spend your time doing. Matt Coffman:	Cool. Sam Ovens:	What would you say has been the, or what would your number one piece of advice be for other members? Maybe it's people who are struggling, people who are just getting started, or people who are kind of plateauing in their business. I'm sure you've seen a lot of the different questions people ask in the community, and on the calls and things. What would you say to them? Matt Coffman:	Looking back, I would say the, so that moment where we took the funnel live, and then I was driving home, and then an SS booked, and I turned right around and did the SS from Vic's house, that was probably the pivotal moment in my life, in business at least. That moment was the moment everything changed, and I had such a fear around talking to strangers on the phone like I can't even tell you. Victor, handing off the sales calls to Victor a few months in, there were a lot of reasons to do that, but I'm glad I got three months of I did all the sales calls from the very beginning, because that grew me like nothing. I would just ... Matt Coffman:	In retrospect, if I had gotten on the phone with strangers faster, things would have moved faster, and so that was this huge block in my way, and just that first just actually getting the funnel live, actually getting that call booked and actually doing it, was the single thing that had to happen, and everything else happened after that, and nothing would have happened if I hadn't just gotten over that resistance and that block around getting on the phone with that stranger, and so my advice would be to look for that thing in your life that is just, "Ah," like it was so obvious in retrospect, so maybe you can't see it in the moment, but try really, "Where is the thing I'm resisting doing, the one thing that if I actually just blast that down and that becomes not only ... " Matt Coffman:	I did shift. I went from being afraid to talk to strangers on the phone to, "Oh, my God. When's my next SS? Let's build this thing." That transformation, that was profound and massive, and so I would, that's my piece of advice would be look for where that block is for you, that big block that if you knock that over, everything will change for you, and you know, deep down, you know what it is. There's some fear that you're avoiding something. There's something that you don't want to deal with. For me, it was talking to strangers on the phone. It was just that freaked me out, like when we were doing Consulting Blueprint, following up with those people from the lumpy mails and all that stuff, that was so scary, but the first SS, actually having a script and doing the script, and selling someone into something, that was the moment, and so that's my piece of advice. Sam Ovens:	I like it. Where can people find more about you? We're going to put this on YouTube, and it'll be open to the public, too, so a lot of people might watch this and think, "Oh, I know someone with a therapy practice that could get help from you," so how do they learn more about you? Where do they find you online? Matt Coffman:	Yeah, so is our program. It's so feel free to send it to your therapist friends. That's the best place you can watch our presentation and schedule an SS if you'd like to join, if you're a therapist. I mean, honestly, I lay pretty low. I'm not on social media. I don't do any ... I just focus on the program. I'm in our Facebook group, and I'm building the program, and I'm working with our team to make our results better, so I'm not easy to find, and I'm not on anywhere else. You can go to our website. You can check out our stuff and schedule an SS. That's how to learn more. Sam Ovens:	website name Matt Coffman:	Yeah. Sam Ovens:	Cool. Awesome. Well, thanks a lot for jumping on and sharing your story. That's one of the best ones I've done so far, and I think you answered like three of my questions with the best answer I've heard so far, and I've done 39 of these. Matt Coffman:	Cool. [inaudible 00:54:28] share our story and yeah, just love your work, and anyone who's watching this, if you're at all on the fence, I can just tell you it's life-changing to join Sam's program, so go for it. I, 100%, good, positive recommendation. Our results are a very clear testament to what he's teaching. Sam Ovens:	Thanks. Cool, man. Well, I will speak to you soon. Matt Coffman:	Cool. Thank you.